Estimated time to complete: 2-3 hours with guide & text-skip. Minimum # of routes required: 1 route and clean up of flow chart & extras. 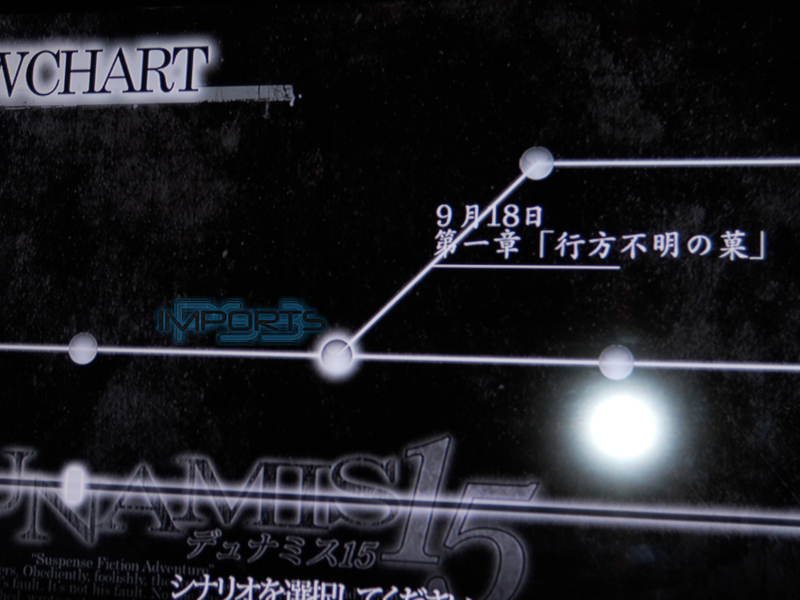 Dunamis 15 is from the visual-novel publisher: 5pb. The game is 99% straight-forward but with some choices to be aware for the Platinum. This is an easy visual novel, considering it can take anywhere from 2-3 hours to Platinum with the proper guide. Credit to gamekana999 for the video. : Enters command, or choice. : Cancels command, or stops text-skip. : Opens up the backlog of dialogue. Q: How do I continue my game, if I got a bad ending? A: Go to the main menu, press on CONTINUE then QUICK LOAD, finally SAVE NO. 1. Q: How do I find the flow chart (フローチャート)? A: Press and click on フローチャート. Q: How do I create or load a manual save? A: Press and click on セーブ to create a manual save. Press on ロード to load the save data. Q: Do I need to receive all bad endings? A: No, just one bad ending then, complete the game within the walk-through. -Press on "NEW GAME" in the main menu. welcome to DUNAMIS base unlocked!!! Change the スキップモード option to 全て and change the text parameters all to the right, then exit with . Contrary to the melody of God established by sheep (神の定めた旋律に反する羊) unlocked!!! -Press then press out of the backlog. Sad sheep looking into the past (過去を振り返る哀れな羊) unlocked!!! -Press and go to TIPS, click on a any number, then press to exit. Sheep possesses knowledge (知識を獲る羊) unlocked!!! Step 2: Complete walkthrough. Read Spoiler for more info. SPOILER: Use this walkthrough from Chapter 1 to 5 plus, the epilogue of the story. A "+1" is mentioned in some of the choices to avoid any or all bad endings. If, there isn't a +1 then, the choices don't make a difference on what you choose, unless noted. Lead sheep to an unexpected death (死への導きにあらがえぬ羊) unlocked!!!! 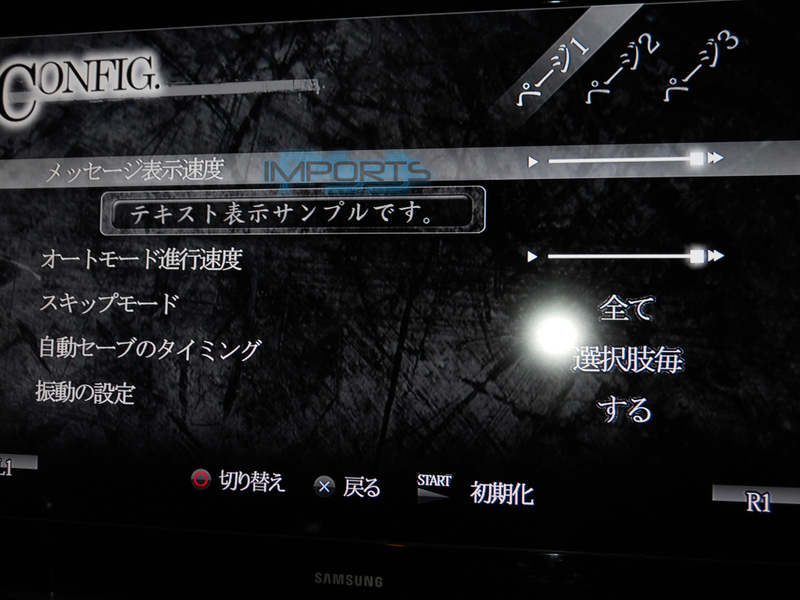 Press on CONTINUE>QUICKLOAD>SAVE NO.1 to continue from the walkthrough via the main menu. Chapter 2: 3rd Loop cleared (第章3rdループクリア) unlocked!!! Choose any choices. I chose all of the top choices and this chapter is short. 50% CG Event Complete (イベントCGコンプリート率50%) unlocked!!! Chapter 3: 1st Loop cleared (第章1stループクリア) unlocked!!! Eat prime sheep (食べ盛りな羊) unlocked!!! Chapter 4: 4th Loop cleared (第章4thループクリア) unlocked!!! Sheep was too close to the truth (真理に近づきすぎた羊) unlocked!!! Some sheep start a romance (とある羊たちのなれそめ) unlocked!!! 75% CG Event Complete (イベントCGコンプリート率75%) unlocked!!! Press and press on TIPS> read all tips #39 - #51 in one sitting. Sheep yearn for an innocent maiden (無垢な乙女に憧れる羊) unlocked!!! 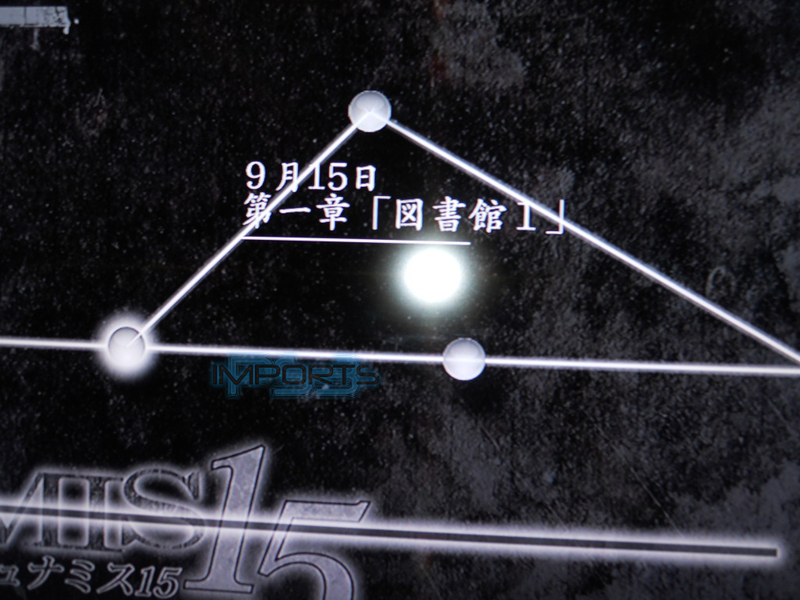 Chapter 5: 5th Loop cleared (第章5thループクリア) unlocked!!! Press then, wait for the staff roll credits to end. Sheep broke the loop (ループを断ち切る羊) unlocked!!! Press on MUSIC> press on one song> press to exit. Sound of blissful sheep playing (祝福の音色を奏でる羊) unlocked!!! Press on GALLERY> press on any CG photo> press to exit. In the Sheep's memories (想い出の中の羊たち) unlocked!!! Press on FREETALK> press on each character > press , when you have listened to all characters in one sitting. Our Talking Sheep (羊たちの語らい) unlocked!!! Afterwards, go to the TIPS section and press on all of the 126 tips in one sitting. All Sheep know (全てを知った羊) unlocked!!! 100% CG Event Complete (イベントCGコンプリート率100%) unlocked!!! Press on NEW GAME in the main menu. Press while reading the dialogue. 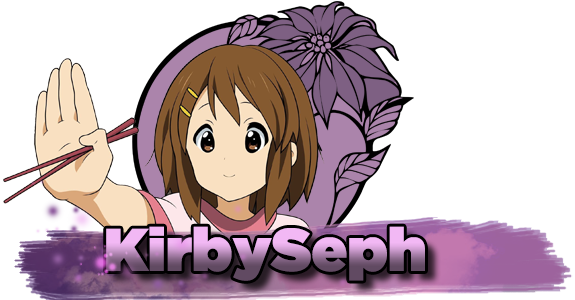 I would recommend to turn off the text skip, as you will not be able to view the backlog. Press while reading and press on コンフィグ to change settings. I would recommend to turn off the text skip, as you will not be able to view the config. Press : while reading, then click on TIPS, and on any tip number. I would recommend you turn off the text skip, as you will not be able to view the TIPS. Click : on tip #68 in the TIPS section. This first appears in the latter part of Chapter 4. Click : on tip #95 in the TIPS section. This first appears in the latter part of Chapter 4. Click : on all tips from #39 to 51 in the TIPS section. All tip's availability appear in the end of Chapter 5. From Chapter 1-5 + the Epilogue, you will obtain 123/126 TIPS. Afterwards, you will need to follow the flowchart to 3 locations and make sure to wait for the TIP to unlock while text-skipping, then move to the next location!!! Finally, go to the TIPS section and click on all of the 126 TIPS. Story-related, unmissable and unlocks in the beginning of Chapter 4. Story related, unmissable and unlocks after you have cleared Chapter 1. Story related, unmissable and unlocks after you have cleared Chapter 2. Story related, unmissable and unlocks after you have cleared Chapter 3. Story related, unmissable and unlocks after you have cleared Chapter 4. Story related, unmissable and unlocks after you have cleared Chapter 5. Story related, unmissable and unlocks after you've watched the staff roll credits. Receive a bad ending in Chapter 2, 4 or 5. 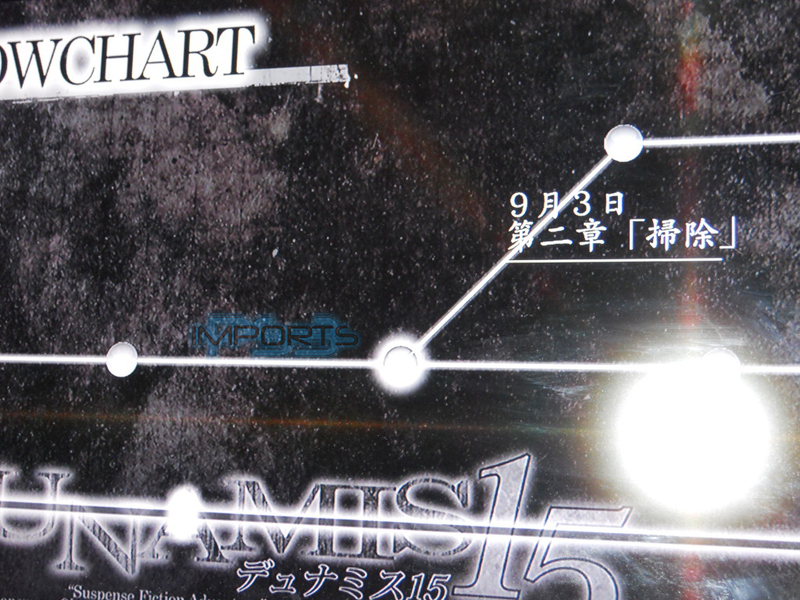 Look at the walkthrough for more details on the bad ending choices. You only need 1 bad ending for this trophy! In the main menu, press on EXTRAS. Press on FREETALK> press on each character > press when you have listened to all characters in one sitting. Make sure, that the speaker icon is no longer around for each character, then move to the next character. 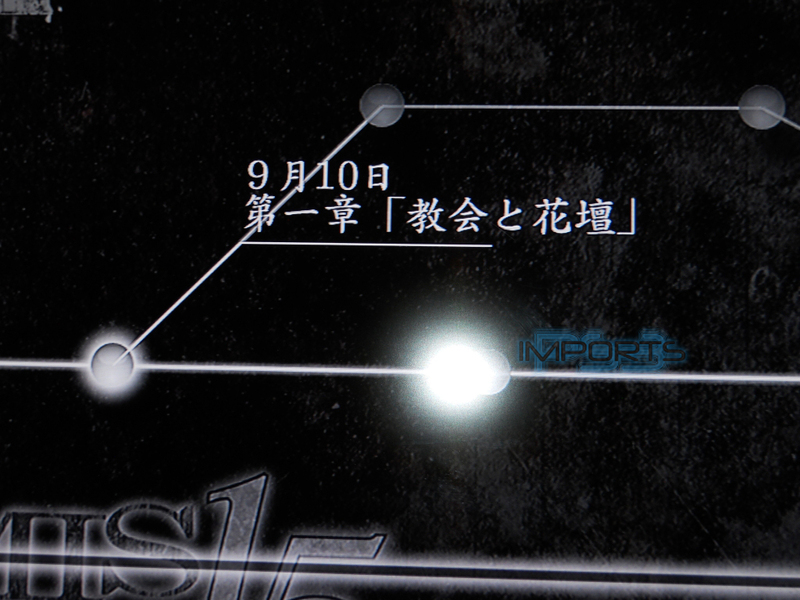 From Chapter 1-5 + the Epilogue, you will obtain 99% of the CG events. 第１章9月10日「教会と花壇」: Choose もう少し散歩する to unlock the 1% missing of the CG collection. The Platinum unlocks when you have obtained all other trophies. Guide re-formatted and pinned. Excellent guide, Main! MINI will add our images at a later time. Thanks! Thanks Cap & RD for help on the images and icon forum codes. Oh thank god I can finally finish up the plat. Thank you MC for the guide! No problem GK, always nice to see another Evangelion fan on here. If I choose '0! ', this choice keeps repeating until I pick '1! ', which leads to a bad end. I've repeated the entire chapter. The same happens. I had to delete the save file and start the game all over again. At the mentioned point, the playthrough continued normally. Thanks for the guide; was a bit lost at first and messed up a bit on first play through as I did not understand why there was multiple options given and no options shown for some chapters. I guess I am too used to only 1 option given for every single case, haha. 1) No options shown for chapter means anything is fine, though choosing all first option will be best. 2) Multiple options shown for chapter also means anything is fine, though once again first one will be the best. 3) When there is a +1, go for the +1 option. In any case, perfect guide. This game was definitely a bit of a pain, but would've been impossible without the guide so could be worse! Cactuarism2's three points above really ought to added to the intro as they really helped. All done in about 3.5 hours but I think 3 is doable if you don't get confused at all. Guide was fantastic and easy to follow. if someone has problems with the tips, as I had, from this guide that tells where each is earned. Missed the part where I had to quickload to access the flowchart, and tried to do it from the main menu - extras - flowchart, and didn't understand why it didn't work. Sorted it quickly. Thank you for the guide. It made the plat pretty straightforward. I did manage to screw up in the flow sheet going for the tips. You really need to go from last to first, I believe, as it over writes your progress. So start on the right and work back to the left. You also need to let it run til you see the tip pop up - this should be obvious, but I was playing another game and this was running in the background, so I didn't notice the notification. If you just let it run to the next selection post, you should be good.